My own personal re-connection with nature came in 2011, through 250 walks into the local landscape simply noting the everyday things in nature. During that year I found that a journey of discovery is not just to wild landscapes, but also finding wilderness in simple places close to home. The writing developed from the re-discovery of the natural year to an exploration of the interface between nature and mind. Through regular engagement with everyday nature, I found a universal story about our connection to it – a story of a unity of life, mind and nature. Those 100,000 words, written on foot while walking the rivers of human habit across the landscape, laid the foundations for the research featured on this blog – indeed the 3 Good Things in Nature intervention was inspired by my experience. “Here is a journey to savour, be delighted by and inspired to go and see for oneself. A new type of mindfulness and presence in the world.” – Prof. Paul Gilbert, OBE – Author of The Compassionate Mind. “Guided by the philosophy of the Victorian naturalist and philosopher Richard Jefferies, this atmospheric and unique account takes time to consider the reality of individual trees, birds, and other natural phenomena. Miles aligns and merges the meeting places between research and creativity with skill and precision, so that the two complement one another. In doing so he achieves something new – a style and concept in the tradition of Jefferies, but very much based in contemporary pertinent questions of the relations between mind and the surrounding world of matter.” – Dr Rebecca Welshman – co-author Richard Jefferies: an Anthology (2010). 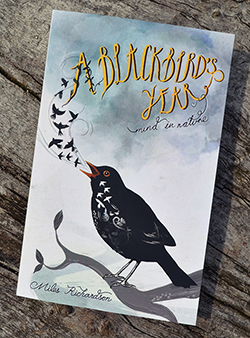 The writing formed two books, Needwood and A Blackbird’s Year. A hundred or so copies were printed and there is potential for wider publication.